It’s fun to dip into a novel with absolutely no idea what to expect. Okay, I knew it was something to do with aliens but beyond that all I knew was that Steph had reviewed it favourably on Mountains Of Instead. For some reason the simplistic yet beautiful cover convinced me that it would be an easy read, just right for someone feeling threatened by a reading list which could stretch to the moon and back. Goes to show the old maxim isn’t necessarily true. I was onto a winner. The Humans opens with a spot of possession. It transpires that the key to the universe is hidden within the world of mathematics. Functions and formulae can unlock the secrets of interstellar travel, longer life and myriad other mysteries, with prime numbers playing a key role. However these powers are not to be taken lightly, nor entrusted to species incapable of handling them responsibly, species like us. So when Professor Andrew Martin finally solves the riddle of Riemann’s Hypothesis, the idea that there is some order to the apparently random appearance of primes, the watchmen of the universe decide that something must be done. His consciousness is obliterated and control of his body turned over to an anonymous low-ranking agent charged with eliminating anyone with who he may have shared his revelation, family included. Thus begins what is, essentially, an Ealing-style comedy of errors for the first act as the new visitor struggles to adjust to life among the humans. Is spitting at each other a friendly greeting or just a reaction to his walking naked in the middle of the road after dark? How do they face their mortality without going insane and climbing up the walls? And the rain, how do they handle the constant, awful rain? The social faux pas’s (pases? pie?) mount until pseudo-Martin finds himself in an asylum and finally reunited with his host’s wife and his first target. And here The Humans enters darker territory as the mission begins to take over. Matt Haig has written a quintessentially English fish-out-of-water comedy and plastered it over with a beautifully dark tale of a hapless guest tasked with the murders of those who ostensibly care for him. At times he wears his influences on his sleeves – the debt to Douglas Adams’s Dirk Gently books is apparent – but for the most part The Humans is a truly original read, managing to combine sci-fi tropes, musings on mathematics, thoughts on loneliness and the human condition and some moving insights into the nature of love, all without seeming disjointed or ever losing its flow. Pseudo-Martin’s journey from lonely operative in a strange world to reluctant assassin to, well, wherever he ends up (no spoilers) is an unsteady one. Haig does a wonderful job of communicating his every doubt and revelation, every internal struggle with which he wrestles. Indeed one of the most startling things about The Humans is just how human this decidedly non-human being appears from the outset. Aside from the obvious problems his emotional reactions soon assimilate into his new surroundings, lending an unexpected depth and feeling to the novel. In fact it soon becomes clear that the real message hidden in this story isn’t that of an outsider trying to understand us, but how hard we must struggle to understand ourselves. 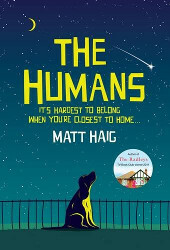 While it occasionally wonders briefly into irritatingly twee territory, The Humans is a consistently enjoyable read, one that challenges you beyond what would be expected for such a simple concept. The gravitas which Haig manages to squeeze out of otherwise slapstick moments is quite incredible. For that reason the book has a hugely wide appeal, encompassing comedy, sci-fi, thriller and deeply emotional and thought-provoking drama. One to recommend without hesitation.